I will be more then happy to post the details and picture on this website and to the lists. Do you need to rehome your bloodhound? 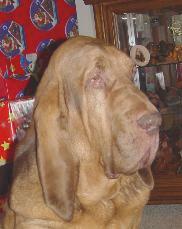 I have rehomed bloodhounds for over a dozen years. the parent club for the bloodhound breed. Please contact me and I will see if I can assist you. If you are lookinig to adopt a bloodhound, please let me know.. I have several young bloodhounds needing a good home. Part of being ethical is to avoid contributing to the problem and to contribute to the solution. ABC (parent club) BREEDER or from Bloodhound Rescue. Extensive Listing of Search Engines & Veterinary Search by NET VET Yahoo! Zubie joined us on Mother's Day eve in May of 2012. Many more pictures of bloodhounds. If you see any corrections, additional links to add, please send me an email. and men have ceased to exploit it, because it is cheap and plentiful.